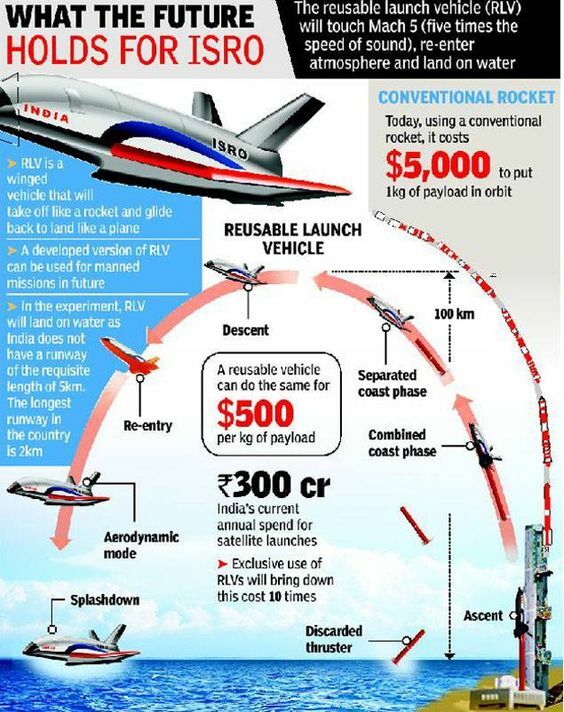 For those who believe that only the Americans and Elon Musk should be building high-tech spaceships, it's worth noting that the Indian Space Research Organization (ISRO) has just completed the first flight test of a small, shuttle like and reusable "space plane." It's hard to believe that, as recently as 2010, Canada was considered to have a stronger and more competitive space industry. Up, up and Away. 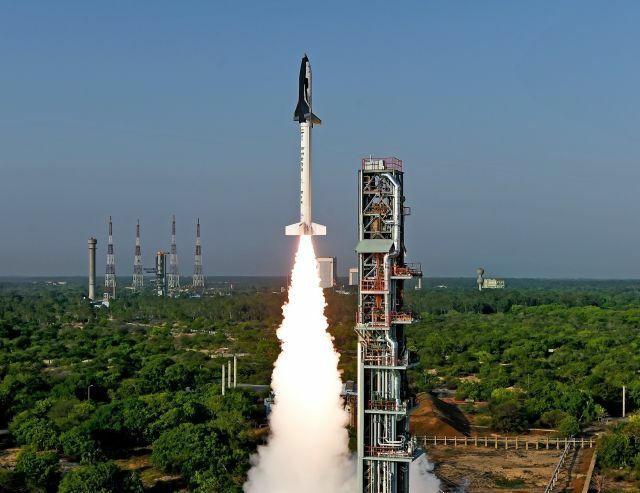 The RLV-TD spacecraft takes off Monday morning from the Satish Dhawan Space Centre in Sriharikota. Photo c/o ISRO. As outlined in the May 23rd, 2016 Government of India Department of Space press release, "India’s Reusable Launch Vehicle-Technology Demonstrator (RLV-TD), Successfully Flight Tested," an ISRO reusable launch vehicle technology demonstrator (IRLV-TD) winged body spacecraft was launched on Monday morning from the Satish Dhawan Space Centre in Sriharikota at 07:00hr Indian standard time (IST). From that peak altitude of 65 km, RLV-TD began its descent followed by atmospheric re-entry at around Mach 5 (five times the speed of sound). The vehicle’s Navigation, Guidance and Control system accurately steered the vehicle during this phase for safe descent. After successfully surviving a high temperatures of re-entry with the help of its Thermal Protection System (TPS), RLV-TD successfully glided down to the defined landing spot over Bay of Bengal, at a distance of about 450km from Sriharikota, thereby fulfilling its mission objectives. The vehicle was successfully tracked during its flight from ground stations at Sriharikota and a shipborne terminal. Total flight duration from launch to landing of this mission of the delta winged RLV-TD, lasted for about 770 seconds. While the RLV-TD will not be recovered this time, the flight was expected to be the first in a series intended to develop reusable spacecraft to drop the cost of going into orbit by an order of magnitude. As outlined in the September 11th, 2011 post, "Canadian Space Competitiveness Falls Behind India Reports International Study," Canadian space competitiveness and capabilities began falling behind the capabilities of India beginning around 2010, the year Canada first dropped to seventh, behind India in the annual Futron Space Competitiveness Index. According to the article, the Futron report also claimed that Canada was starting to lose ground to other big space systems players such as Brazil, China, Israel, Japan and South Korea. Of those countries, only Brazil has failed to launch a satellite into orbit (although it has tried several times). For those that missed the connection, it's pretty obvious that space faring countries with rockets are slowly pulling ahead of space countries without rockets. As outlined in the the April 26th, 2016 post, "2009 Canadian Space Agency Report on Indigenous Canadian Launcher said "Yes!" But CSA Didn't Move Forward," the last Canadian chance to move forward with a domestic launcher was rejected around 2010, about the time India pulled ahead of Canada in space competitiveness. A partially reusable, Australian rocket being developed by Heliaq Advanced Engineering. Graphic c/o Heliaq. Today, even Australia is researching reusable space vehicles. As outlined in the January 29th, 2016 Spaceflight News post, "New Vision of Reusable Launch Vehicle from Australia," the Australian company Heliaq, in cooperation with University of Queensland, is developing reusable technology capable of lifting "from 80 kg to 550 kg in low Sun-synchronous orbit (SSO). It could be compared to new launch vehicles developed in different countries like Long March 11 in China, ALASA or more conventional Super Strypi in USA." The Australian launcher capabilities are comparable to the rejected Canadian proposal. The only real difference was that the Canadian proposal wasn't reusable. After all, we Canadians are always a little behind the leading edge.